Everybody gets to watch the post-fight press conferences following each UFC event. 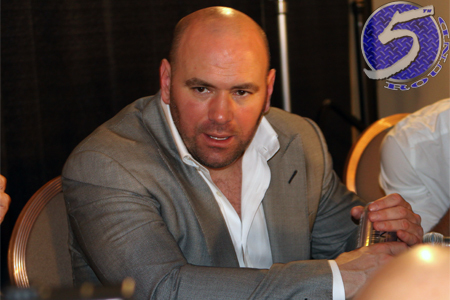 However, the portion that the world isn’t always privy to is the scrum UFC president Dana White (pictured) holds after the presser. Media fire off random MMA questions that don’t necessarily have to do with the show that just concluded. Depending on White’s schedule, sometimes they last 10 minutes and other times they last over an hour. Saturday night’s session was a brief one, but White touched on his talks with Gina Carano, Dominick Cruz getting an immediate title shot (if he wants), Rich Franklin joining OneFC’s front office, Wanderlei Silva signing to fight Chael Sonnen, invasion of Mexico and more.